From the Gilded Age mansions to the yacht-filled harbor, Newport doesn’t shy from opulence. But this is aristocracy done the old New England way—it makes its point powerfully, yet low key. Think: blue blazers, loafers, stripes (lots of stripes),impeccable manners, and cocktail parties (lots of cocktail parties). AS AN ANTIDOTE TO ALL THAT SOCIALIZING, NATURE SHOWS OFF IN STUNNING WAYS: THERE ARE BIRD SANCTUARIES WITH JAW-DROPPING COASTAL VIEWS, OCEANFRONT HIKES WITH STELLAR SUNSETS, AND A WILDLIFE REFUGE BY THE SEA. PERHAPS MOST IMPORTANT TO NOTE: NO MATTER WHAT YOU DO HERE, BOATS ARE A CENTRAL THEME— WHETHER YOU’RE ON THEM, SURROUNDED BY PAINTINGS OF THEM, OR JUST LISTENING TO STORIES ABOUT THEM. 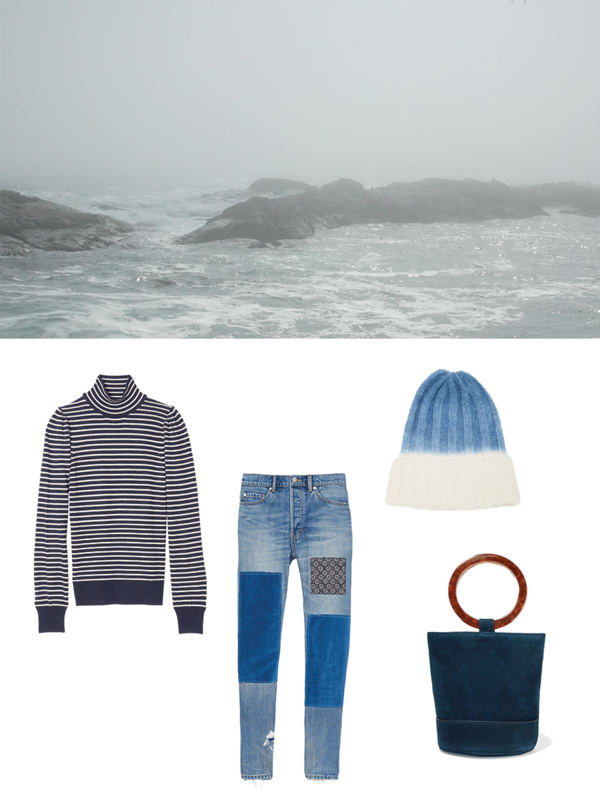 A cozy cable-knit sweater helps ward off the seaside breeze. 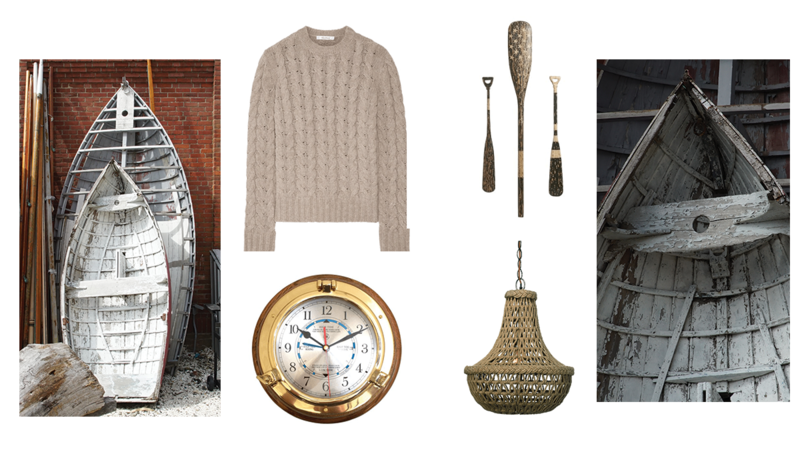 Add a touch of nautical flair to your study with a porthole clock in oak and lacquered brass. 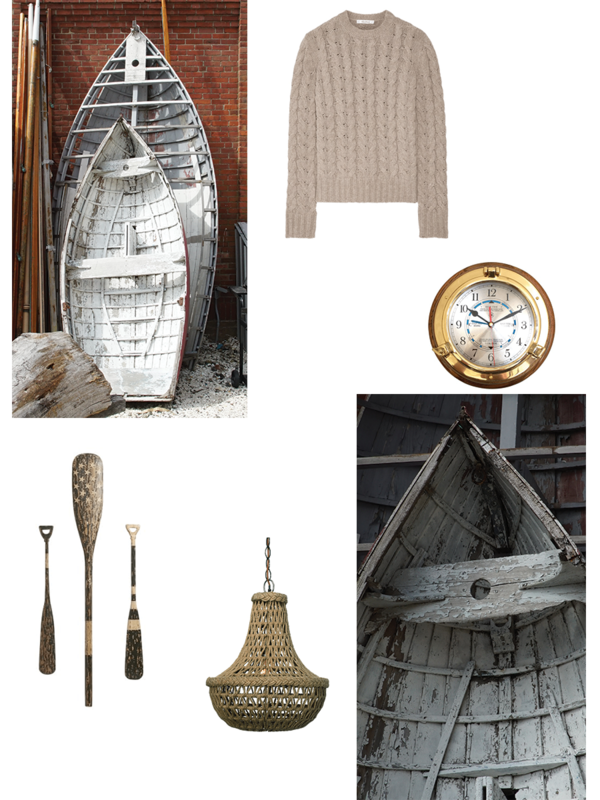 Mountable hand carved oars and a macramé chandelier LEND rustic appeal. There’s nothing more serene and calming than the sea and the color blue. 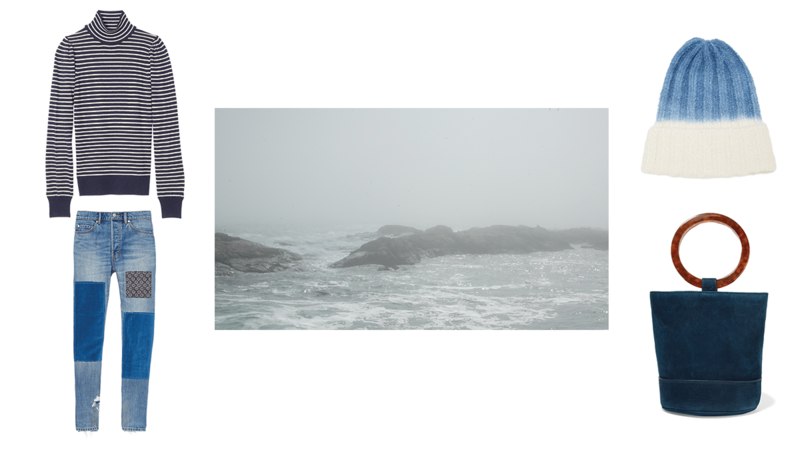 Feel New England’s heritage in Rebecca Taylor’s striped turtleneck and patchwork jeans. A luxe update on a classic knit hat: Elder STATESMEN'S in cashmere ombre. 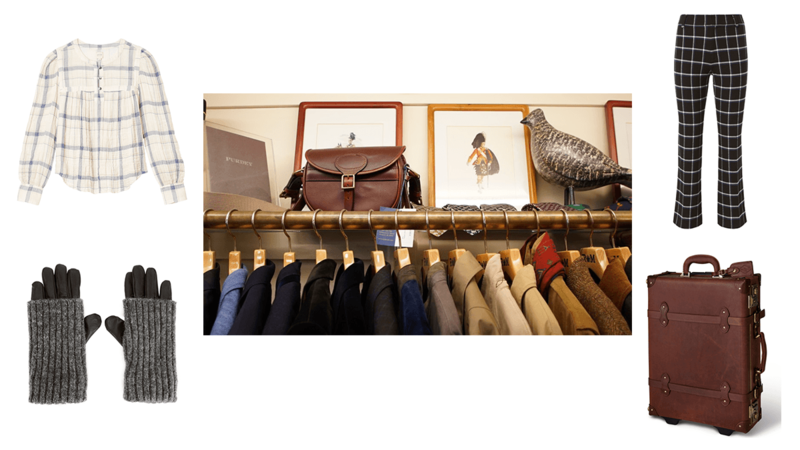 THIS AND a tortoiseshell handle handbag in a preppy silhouette by Simon Miller are all the accessories needed for a tour around town. 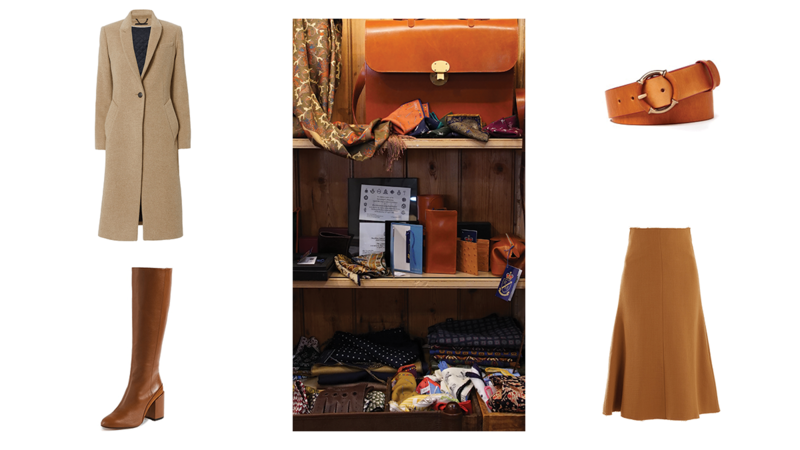 A peasant top and flared trouser in windowpane check pair elegantly with accessories in luggage brown. Steamline’s Pioneer Carryon brings retro vibeS and substantial polish to all modes of travel. 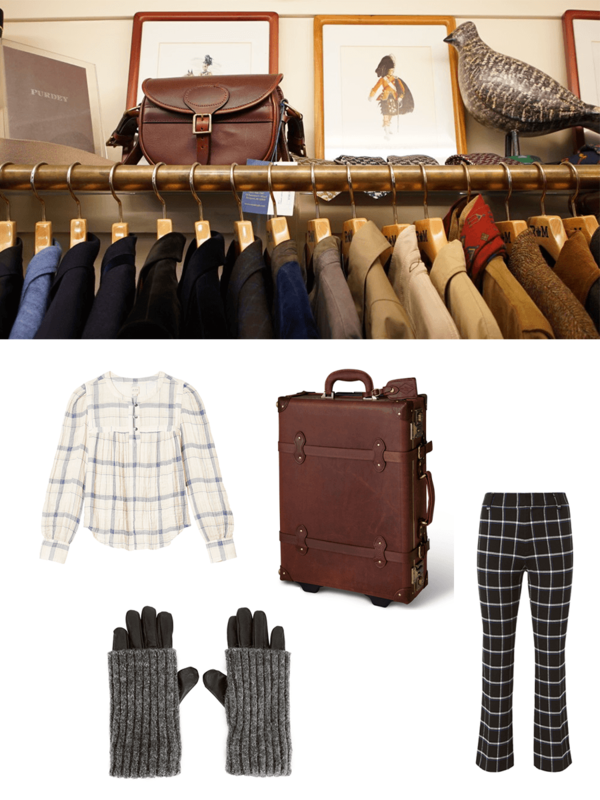 Popover gloves in both leather and wool provide extra warmth and, when worn separately, allow you to tap away on devices. 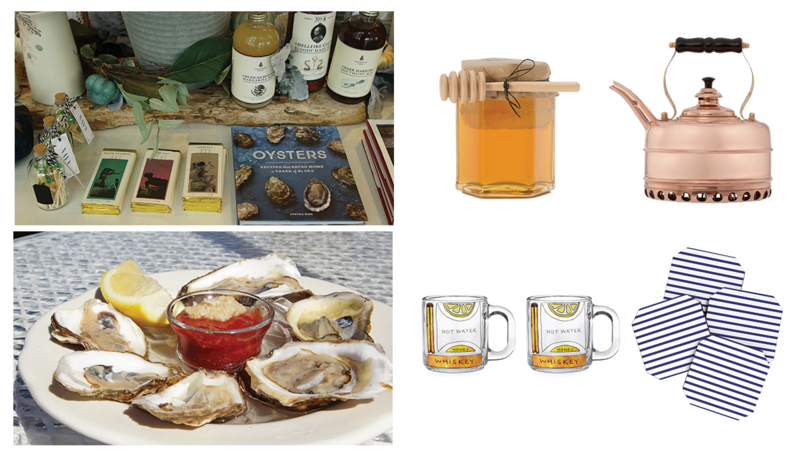 Newport’s seafood tradition abounds. 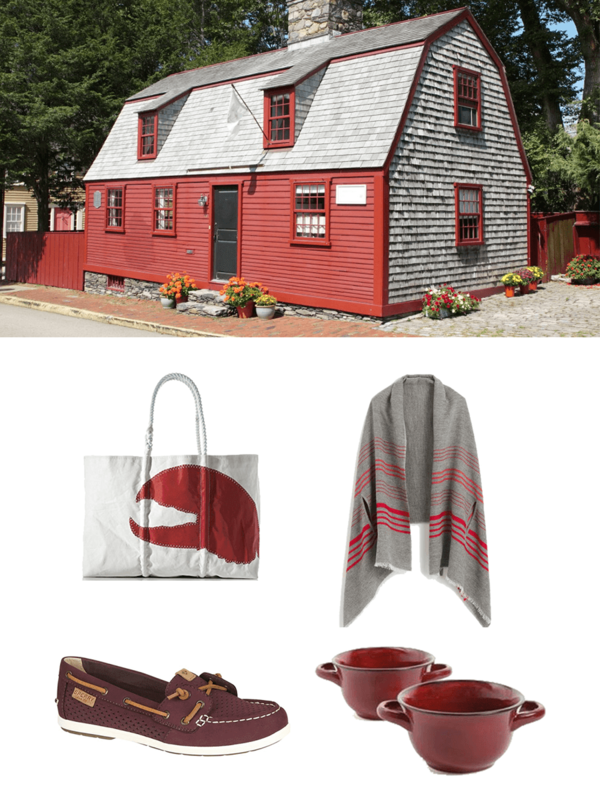 Carry this lobster claw tote made of recycled sails WHILE WEARING a luxurious wrap covered in bold red stripes. double handled bowls filled with chowder make for a delightful cold weather treat. 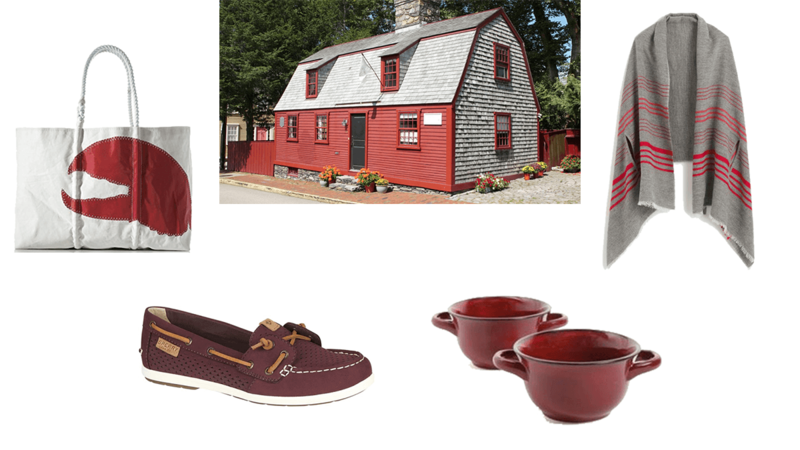 no New England spread would be complete without Sperry’s classic boat shoe - particularly cool in THIS rich burgundy. 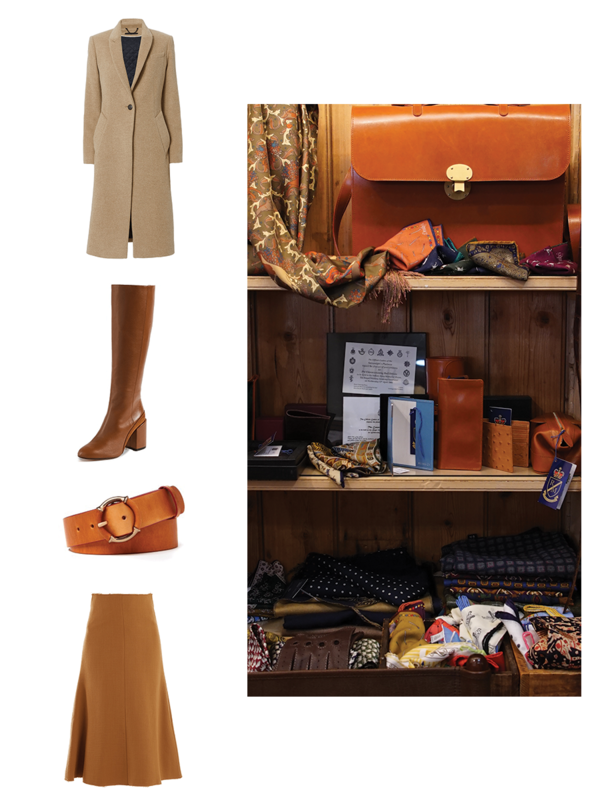 Everything camel to butterscotch, this is the go-to neutral on the coast. From a picture-perfect coat by Rag & Bone to a timeless boot and J. McLaughlin belt to a midi skirt that feels both modern and vintage at the same time. All you need for a cozy night in: a copper tea kettle, honey, and hot beverage glasses make the perfect toddy. 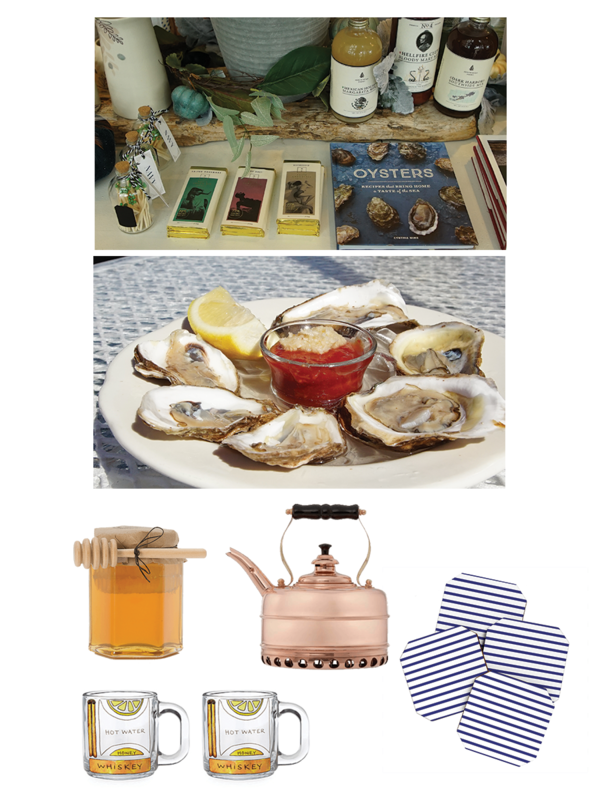 Entertain with seaside flair and sit your drinks atop striped coasters. 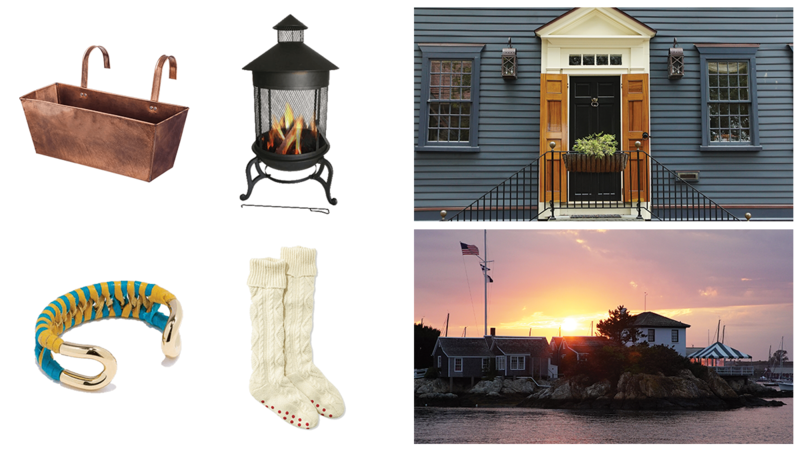 A hurricane style fire pit keeps your outdoor space smelling like the season, especially when enjoyed in a pair of LL Bean socks. 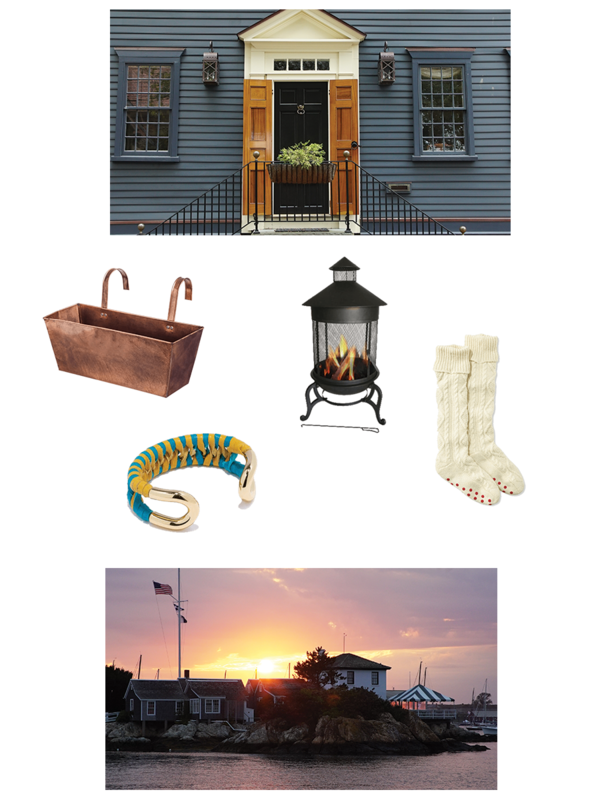 Giles & Brother’s wrapped cuff channels sailboat style; a copper planter bring in the charm of a cottage.